"We have former astronauts, military personnel, police officers and the former defense minister of Canada come forward stating that extraterrestrial UFOs are real ... How can this be ignored and brushed off as nonsense?" It seems like every day, a video or image emerges that appears to show a UFO near the International Space Station. And it generally -- OK, always -- turns out not to be a UFO. It's normally space debris, light reflections from the station windows, an antenna attached to the station, etc. But wouldn't it be interesting if someone actually launched a satellite into Earth orbit (illustrated above), with the specific mission of trying to detect and prove unknown objects are actually out there? 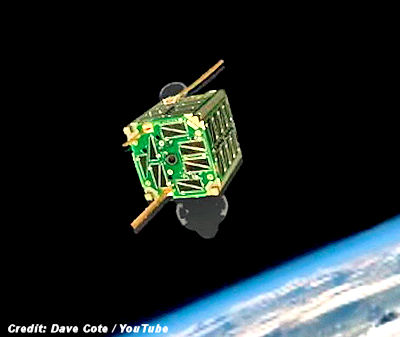 Get ready for CubeSat for Disclosure, a team of researchers brought together by software engineer Dave Cote, who have a common purpose in launching their own satellite: To find and verify a real extraterrestrial craft.